Large crowds turned out in Cobh on Sunday (24 March) to see the Moon Car which was parked on Kennedy Pier / the Pier Head for most of the day in conjunction with a talk by John Jefferies to mark the 95th anniversary of the Cobh Pier Head shooting. Mr. Jefferies outlined the arrival of the Rolls Royce in the streets of Cobh on that day and the action of its passengers who used two machine guns to fire on unarmed British troops arriving from a passenger vessel on the Pier Head. The account then covered the huge manhunt, the fruitless search for the car which was not seen again for 57 years and finally the sequel of the car’s rediscovery in 1981 and its eventual restoration. All of this as part of a bigger story of mystery, intrigue and political chicanery. TICKETS ON SALE NOW! See the original Moon car and hear it’s incredible history in a talk on Spike Island Cork, Sunday March 24th boats 1pm and 2pm. In March 1924 a group of men wearing Irish army uniforms pulled up at the main pier in Cobh, Co. Cork. Seated in a yellow Rolls Royce Silver Ghost, they watched around 50 British soldiers disembark from a ferry from Spike Island. Suddenly the men in the Rolls Royce produced machine guns and fired on the British soldiers. One soldier was killed while eighteen others and six civilians were injured. Driving away at speed, the Rolls Royce stopped briefly to fire on a British warship in the harbour. An hour later armed British soldiers returned to Cobh and more shots were fired. Aerial photo of Spike Island, Cork Harbour courtesy of Fortress Spike Cork. There followed one of the biggest manhunts in modern Irish history, making front-page news throughout the world. The Rolls Royce and its occupants seemed to have vanished into thin air. The car was not seen again for 57 years. In his book Death on the Pier, John Jefferies unravels fact from myth surrounding the Pier Head shooting and the amazing story behind the mysterious Rolls Royce known as the Moon Car. My thanks to Brian Gabriel of Blarney and District Historical Society for allowing me the opportunity to speak at the monthly meeting of the society on 7th March. I was heartened by the turnout of over 80 people, some of whom had travelled up to 50 miles to attend. Among those who attended were direct relatives of some of those who were involved in or witnessed the Cobh Pier Head shooting of 1924 and in particular I would like to thank the daughter of Hannah Hayes who was the youngest victim of the shooting and who received a life-changing injury in the attack. My thanks also to Brian Ó Donnchú for his help in putting the historical society in contact with me. It is fascinating that as it approches two years since I wrote the book and 95 years after the Cobh shooting that information continues to be supplied to me by people with a direct or indirect connection to the event. Copies of the book “Death on the Pier” are still available. For the ideal Christmas Gift for anyone interested in Irish history or who just likes a good thriller. New information – and a photo! I was delighted to receive an email from Ian MacTaggart from Kent, England this morning which filled some missing information in our record of Private Herbert Aspinall who died as a result of the Cobh Pier Head Shooting of 21st March 1924. Ian told of how his grandfather Neil MacTaggart, who was born in Cobh, had in his personal effects a photograph of a young man with the words “Fishy, killed by unknown men on Friday, 21st March 1924”. For many years Ian wondered about the identity of “Fishy” but he knew that he had been a friend of his grandfather Neil and that Neil had been by his side when he was shot in Cobh 93 years ago. Well the mystery is now solved and we can reveal that “Fishy” was none other than Private Herbert Aspinall who died aged 18 in that terrible attack. Ian sent me on the photo of “Fishy” and put it beside the one of Herbert he found on the “Death on the Pier” website associated with my recently published book. So now we finally have a better quality photo of Herbert to compare with the grainy newspaper scan which was all I was able to find of Herbert at the time of publishing the book. Sincere thanks to Ian for allowing me to share the photo and to his late grandfather Neil (died 1999) for holding onto it for so long. Side by side: the photo of Ian MacTaggart’s friend “Fishy” and Private Aspinall. He looks even younger than his 18 years. He may be wearing the team shirt of Lee Rovers, the Cobh soccer team he played with during his time in the town. Can anyone confirm this? Author John Jefferies and the Moon Car. Photo by Liam O’Sullivan. John Jefferies launched his new book Death on the Pier on Cobh’s Promenade yesterday (6th May) as part of the 2017 Cobh Readers & Writers Festival. There was a large turnout of people from Cobh and beyond for the launch of the book which tells the story of the 1924 Cobh Pier Head shooting incident and the search for the mysterious Moon Car. Highlight of the day was the arrival of the Moon Car, a classic 1919 Rolls Royce Silver Ghost registration 5PP. This is the actual car which was used for a speedy getaway by the attackers back in March 1924. Sincere thanks to the car’s owner Patsy McSweeney for “lending” his car for the afternoon and also to the car’s restorer, James Black, who drove down specially from Belfast to collect the car in Dunmanway and onward to Cobh. “My sincere thanks to all those who came along to yesterday’s launch”, said author John Jefferies. “The Moon Car itself was the real star of the show and its arrival was a huge attraction. Thanks also to all those who made the book possible including members of my family, all those who gave information or support over the past four years when I was writing the book and to the printers, Lettertec Ltd, a local company based at Carrigtwohill. Sincere thanks are also due to the Cobh Arts / Readers & Writers festival committee. Finally I would also like to congratulate the other authors who launched books this week. Hopefully a spark has been lit that will see more Cobh and Cork authors writing their own books”. The book is on sale again today (Sunday) at the final day of the Cobh Readers & Writers Festival. John’s bookstall, along with those of nine other booksellers will be in the Promenade all day today. There will be a very special visitor in Cobh this Saturday (May 6th) for the official launch of John Jefferies’ new book “Death on the Pier”. This is the yellow Rolls Royce Silver Ghost known as the Moon Car. The book launch takes place at the Cobh Readers & Writers Festival in Cobh’s Promenade – please note the time of this launch is 5.00pm and not the time advertised in the festival brochure. 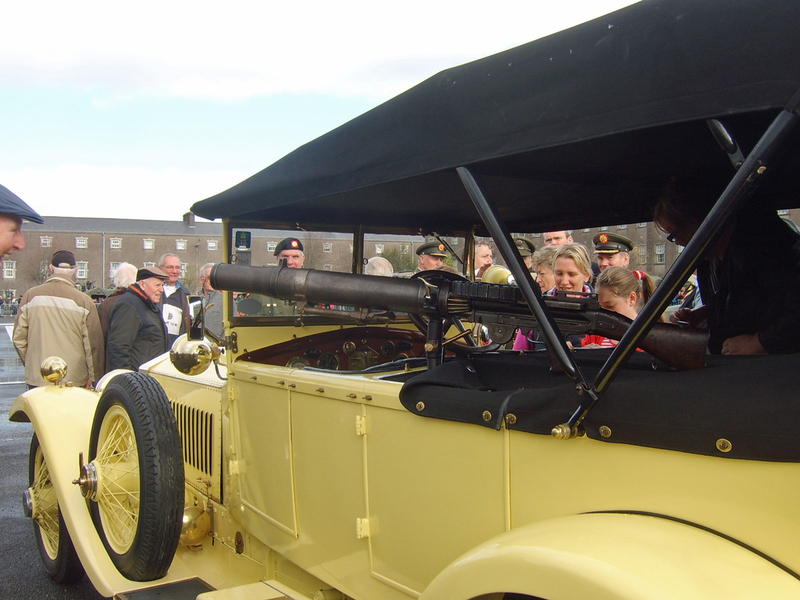 The Moon Car is the exact vehicle that was used in the 1924 attack on Cobh’s Pier Head. After the attack it disappeared and was not seen again until 1981. It was meticulously and lovingly restored a number of years ago by James Black of Lisburn and is now owned by Patsy McSweeney of Ballineen, West Cork. See the Moon Car and learn about its mysterious history in John Jefferies new book at the Promenade on Saturday. © John Jefferies and Death on the Pier, 2017. Unauthorized use and/or duplication of this material without express and written permission from this site’s author and/or owner is strictly prohibited. Excerpts and links may be used, provided that full and clear credit is given to John Jefferies and Death on the Pier with appropriate and specific direction to the original content.